The route passes to the right from the central bastion Mshatka- Kaya . The route is rarely visited. The beginning coincides with the route «Triangle on the left». Having passed 2 pitches by the "Triangle" (50m 70°IV and 50m60°III), go upwards, To the direction of "red" spot under the cornices. Then go upwards and to the left by the crack between the "patch" and the wall , then move by the slab (20m 80°VI), pass to the small corner , and go upwards along it. (20m 85° VIA2). Belay is on the small ledge. Then go upwards by the slab (10m 70° V+) , then move through the overhang (15m95° VIA3) to the huge corner - belay. Then go upwards along the left side of corner (20m70° IV+), then move by easy rocks 30m 60° II to the summit. 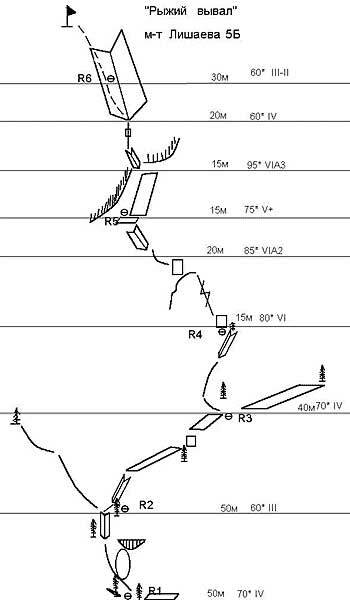 R6-R7 Go along the left side of the corner 20m 70°IV+ , then move by easy rocks to the summit.